Image courtesy of the artist and Jonathan Smart Gallery, Christchurch. Photo by Heather Milne. 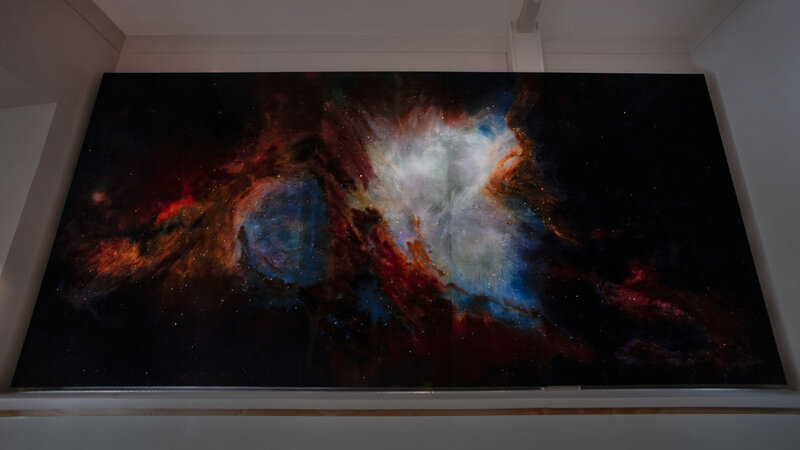 A new sculptural installation within Canterbury Museum, Tunnel creates a walk-through rendering of a nebula: a cloud of gas and dust in outer space visible in the night sky. Nebulae can be where new stars are formed, while others are the remnants of dead or dying stars. Beehre’s images are rendered in dyed silk velvet with Swarovski crystals and LED lights. There is a subtle visual tension between the fluidity of the dye work, the highly refractive crystals, and the rich, light-absorbing surface of the textile. This is the first large-scale installation Beehre has made with an illusion of total immersion. She has created a portal that offers a brief galactic journey in the midst of the Canterbury Museum. Tunnel will create an entrance to the exhibition Wildlife Photographer of the Year, expected to bring 60,000 visitors over the exhibition period. A second work Orion 2018 is hung/mounted on a wall in the Museum foyer. Hannah Beehre’s practice ranges across a variety of media including drawing, installation, and painting. Her works use unexpected contrast to establish visually intriguing relationships, and suggest forces beyond human control. With her immersive works the viewer is situated within, and subject to, the environment rather than existing in a position of dominance over it. Previous collaborations with Aaron Beehre have included site-specific interactive and immersive video works at City Gallery Wellington, Auckland’s Te Tuhi Gallery and Christchurch’s post-quake NG artspace. Beehre was the recipient of the Parkin Drawing Prize in 2016 and is currently undertaking an MFA at the School of Fine Arts, University of Canterbury.